Del Oro Division continues its focus on workforce development for clients. The workforce development movement continues to grow in The Salvation Army Del Oro Division, as its Culinary Arts Training Program in Sacramento, California, established a meat-cutting training partnership with local Raley’s Supermarkets. Previously, the division launched and promoted the expansion of its construction training program as well as its staple culinary arts training programs. “The workforce development program outreaches are working extremely well. We’re scaling it up and making the program more robust,” said Major Martin Ross, who in addition to serving as the Sacramento Social Services Secretary, is taking on a new role in enterprise development for the division. Ross said Raley’s representatives were intrigued by the meat-cutting posters up in the Sacramento Culinary Arts Training Program classroom, laying the groundwork for the partnership. In response, the culinary arts program implemented an additional week of meat-cutting training, focused on primal cuts, to its existing curriculum. “Our folks are trained heavily in knife skills, and they know how to handle that,” Ross said. Through the partnership, Raley’s brought in hiring managers who conducted job interviews with the program’s students, selecting three of them to be hired by the grocery store chain for a pre-apprenticeship. 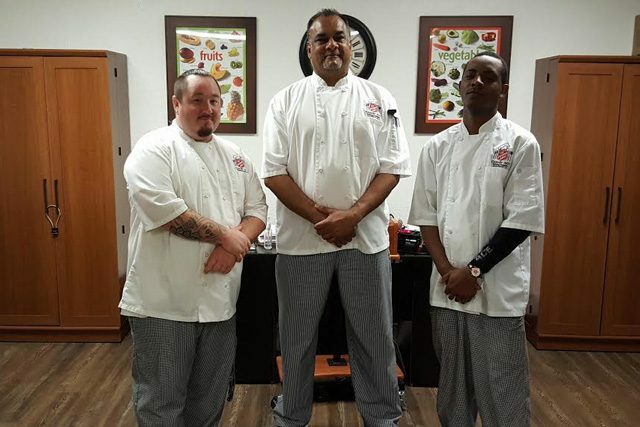 (L-r) Steven Jarrell, Umesh Singh and Chris Johnson are students in the Culinary Arts Training Program in Sacramento, California, who are now employed by Raley’s as part of a meat-cutting partnership with The Salvation Army. The students started working at Raley’s in different food service areas part-time, as they continued their culinary studies with The Salvation Army. After a certain amount of work hours, they would be eligible for a full-time position. “It provides motivation to the students to have employment before they graduate,” Ross said. Raley’s also awarded The Salvation Army with an $8,000 grant to cover the hired students’ culinary training, as it costs The Salvation Army approximately $2,000-3,000 per student to go through the class. Ross said Raley’s has already expressed interest in continuing the partnership for future class sessions. The selected students are grateful for the opportunity. Steve Jarrell, who is working in the meat department, sees Raley’s as a place he would like to work for the rest of his life. There is a lot Ross wants the students to get out of this partnership. Ross is excited for what the workforce development focus will bring for The Salvation Army, and encourages more companies and organizations to join in their efforts to get clients back to work.